Located in downtown Sarasota’s historic Laurel Park neighborhood, Discovery Days Preschool offers a quality education in a safe and nurturing environment. Established in 1992, Discovery Days is a family owned and operated preschool dedicated to helping your child become an enthusiastic learner. Our limited class sizes are led by skilled and caring teachers who provide students with the individualized attention each child deserves. 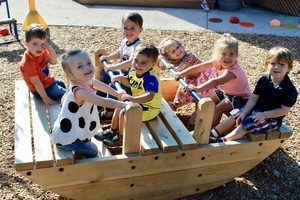 Our small, private "boutique" preschool is one-of-a-kind! Check out our FAQ Page for all the answers! Our Annual Zoo Trip was a great success!